Whether we like to admit it or not, the mainstream media, as we know it, has been indoctrinating the general populace since the 1940s. Currently, society has been given a buffet of news outlets such as CNN, Fox News, and MSNBC to name a few, all of which, have a different political agenda to fulfill and a narrative to tell. Given their targeted audience, these news outlets manipulate and distort reality to best fit their agenda. This creates a misinformed, ignorant society that cannot make educated decisions come election time. So why is this so dangerous? Primarily, the news outlets, who have absolutely no regard for journalistic objectivity, create a bubble around themselves and their viewers. For the viewers, their preconceived notions about society and the world are reaffirmed and substantiated by the news outlets with whom their political ideologies align with. The former conglomerated with a mindset against sharing and debating differing ideas yields what is known as confirmation bias. For the news outlets, actually communicating unbiased, genuine information to the public is the least of their concerns as long as they relay their agenda and maintain their viewership rates. In his article The World of Doublespeak, William Lutz characterizes this deceit that news outlets employ:“It is language designed to alter our perception of reality and corrupt our thinking. Such language does not provide us with the tools we need to develop, advance, and preserve our culture and our civilization. Such language breeds suspicion, cynicism, distrust, and ultimately, hostility.” The language or methods the news uses to deceive the public can be as simple as omitting a crucial detail or glorifying one part of an issue so as to draw the audience’s attention away from other parts. Those who are aware of the media’s tactics may find it difficult to sift through the falsehoods and glorifications to find an unbiased account of the situation. Even more worrying is when debates take place, depending upon what media is consumed by either party, both may be so grossly misinformed that the premise of the debate is futile. 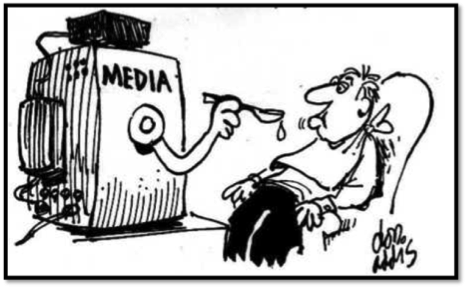 Unfortunately, the mainstream media and news has completely devolved from its original purpose: to inform and educate the public in an unbiased manner. When it comes to politics, it may be difficult for the media to remain neutral, but it has become very apparent that they are making no effort to do so. This comes at a costly price to the people who heavily rely on the news to make decisions about the politicians who represent us. However, as the general public becomes more cognizant of the biased nature of the media, many will become more skeptical of what they hear and more motivated to seek the truth.